Ready to scare up some extra romance this Halloween? There are so many great things for couples to do to celebrate this holiday, it would be easy to overlook or forget a few fun activities. Luckily, we’ve got you covered with a list of great ideas to include in your very own bucket list. 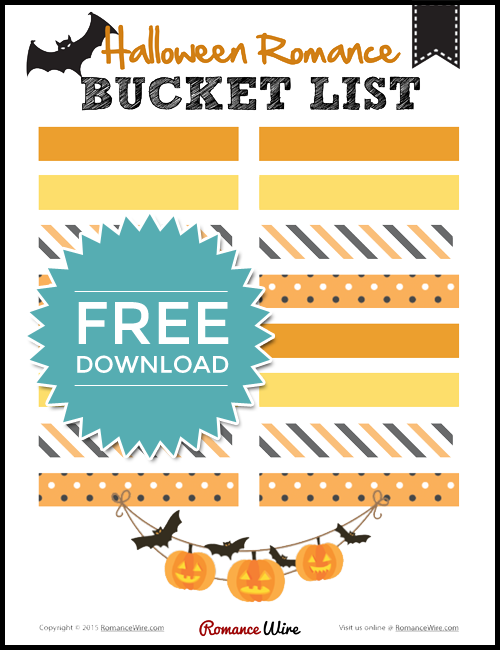 Simply download and print out our free Halloween Romance Bucket List printable, combine our ideas with some of your own, and trick-or-treat yourselves to a little extra couple time! Attend or host a costume party. Look at Halloween decorations in your area. Make pumpkin bread or pancakes. Hang up orange or black lights in your bedroom. Make a Halloween movie bucket list and complete your list! Make a Halloween craft together. Decorate your front porch for Halloween. Complete a Halloween bucket list!